Welcome to The Plonkers™ official web site. Celebrating their 40th Year in show biz. The Plonkers Agricultural Orchestra are an ideal band for County Shows, Local Fetes, Carnivals and Pubs. Combining the local 'yokel' Hampshur' wit of Golly on banjo, with 'Scrumpy' Country songs and an inventive band of very accomplished mooosicians. The ORIGINAL Plonkers Agricultural Orchestra started life in 1979, when Golly entered the Lymington carnival with a cider-making machine 'float'. It was a two-wheeled cart, pulled by Plonker, the donkey, with whistles, bells and various gizmos. The cart was followed by Gordon on banjo, Bob on squeeze box, and a trombone and bass drum. They won first prize, playing the chorus of Drink Up Thee Zider (which is all they knew, but as they kept moving the crowd never realised this!) for the whole parade. They did this for a few years until the 'band' numbered 15. Then one year, the Singing Butcher, booked for the Lymington Vintage Fair, couldn't make it, and Golly was asked to stand in - the first booking for The Plonker's Agricultural Orchestra. They have been plaguing the New Forest and beyond ever since. 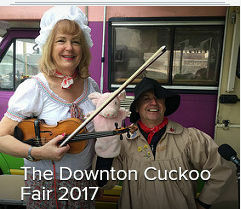 Pictures from the 2017 Downton Cuckoo Fair, Click here to view. If you can take it, scroll down the page for more! six miles south of Salisbury on the edge of the New Forest on the Wiltshire/Hampshire border. The Chickerell Steam and Vintage Show. The Plonkers™ second visit to this great Dorset show. The Chickerell steam and vintage show Ltd is the new name for Portland steam and vintage show Ltd and is a public interest company based in South Dorset that proudly holds the annual Chickerell steam and vintage show at Moor farm, Knights in the bottom, Chickerell during the first weekend of July. The show has established itself as a mainstay of the Dorset vintage show calendar and continues to go from strength to strength. The Plonkers™ are going to Plonkerise Devon yet again! The 40th Devon Coastal Safety Run is on Sunday 15th July 2018. The Historic Transport Club - Devon Coastal Safety Run covers 70 miles of glorious Devon coastal and country scenery. The run starts at Exeter and is finishing in the town of Bovey Tracey with an intermediate stop at Goodrington Sands. Stand by Torbay, The Plonkers™ are going to Plonkerise Devon yet again! More details on the exact gig times as we get them. The Plonkers™ are playing live at the Great Trethew rally on all three days. You can find this event midway between Liskeard and Looe. The Great Trethew Vintage Rally takes place on 24th, 25th and 26th August at Great Trethew, Horningtops, Liskeard, Cornwall PL14 3PZ. Doors open at 8am, show commences at 10am until 6pm. 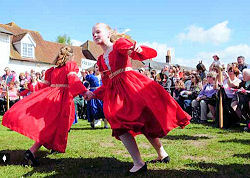 The Plonkers will be appearing live on both days, and its yet another outing for their brand new 10ton mobile stage. The Burley Steam and Vintage Vehicle show. Golly will be appearing with The Plonkers new mobile stage, and, a gaggle of disorderly guests and resident players. Be warned, Golly is doubling up as stage manager for the weekend, anything can and WILL happen. So don't say that you've not been warned!!!!! The Plonkers playing at The Downton Cuckoo Fair. 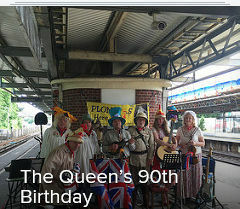 The Plonkers at Brockenhurst Station to mark The Queen’s 90th Birthday. 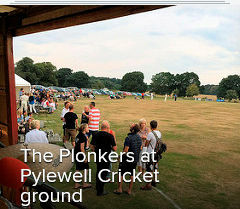 'Plonkers' dodging leather cricket balls at Pylewell Cricket Club. 'RUSTIC RUMPUS' has 15 new songs and is available now online and at gigs. This is the first time 'Proper Music' has been available on CD via the internet! How to book The Plonkers.. Many of The Plonkers gigs are only arranged with as little as a weeks notice so please check here for the regular updates. What is 'Ampshire time you ask? and you get the job done when its finished.